There are so many ways to see the world with Go Ahead, and embarking on a dream tour with your family is arguably one of the best. Just ask Go Ahead Copywriter Jamie, who set off with her mom, dad, and brother on a tour of Naples, Sorrento, & Rome (her family’s first-ever trip to Europe!). They returned with lifelong memories of alfresco meals on the streets of Napoli, sun-splashed days on the Amalfi Coast, and whirlwind afternoons looking for the perfect leather boots in Rome. 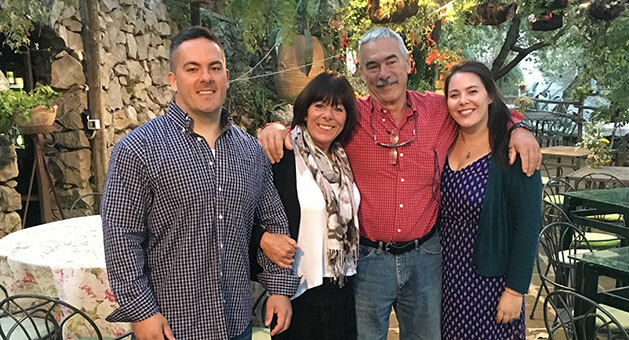 While the whole journey was special, adding the Rustic Italy: Farmhouse Dinner & Wine Tasting excursion was one of her and her family’s favorite moments—here’s why. Our family trip to Europe was a long time coming, and we each had dreams of what we wanted to do and see. For my brother, it was visiting the Colosseum in Rome and for me, it was checking Naples off my bucket list. My mom couldn’t wait to lay her eyes on Capri and the rest of the coast—yes, she did take a dive during free time!—and my dad looked forward to finally tracing his family’s Italian heritage to the source. Those things definitely topped the list as some of the best of the tour. But, one of our favorite moments was sitting down for a home-cooked meal paired with regional wine at Fattoria Terranova, an agriturismo (farm stay) located just a stone’s throw from Sorrento. Here are six things that made the added excursion one of the most memorable experiences of our life-changing trip. 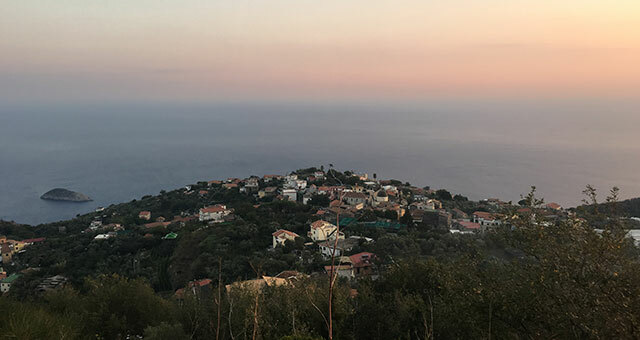 The agriturismo’s unbeatable location in the hills high above Sorrento lent itself to some truly breathtaking vistas, and even the drive there was stunning. Fleeting views of Mount Vesuvius, groves bursting with ready-for-harvest olives, the pink hue cast on the the surrounding hills by the setting sun—saying the journey was lovely is an understatement. 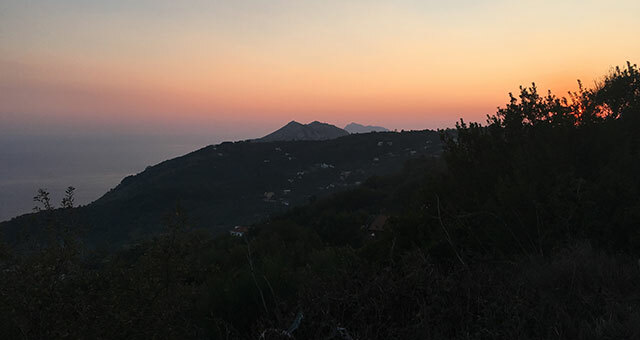 Upon arrival, it was a treat to look out from open-air terraces and admire a quaint hamlet nestled next to the sea and marvel at the way the pastels of the ocean and the sky melted together on the horizon. 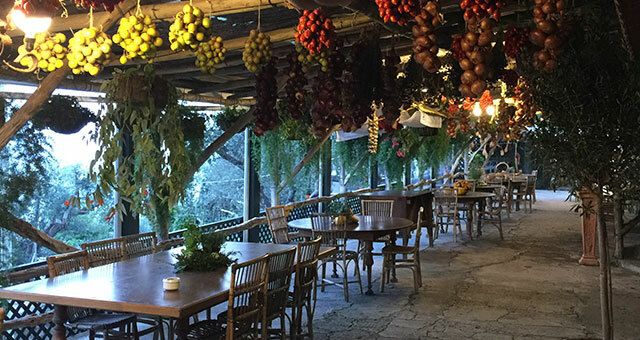 Each nook of Fattoria Terranova was a sight to behold, and while the locale had the rustic feel of an authentic farm, it was nothing if not warm and inviting. Winding stone steps revealed outdoor terraces facing the Mediterranean and indoor dining areas were decorated with seasonal produce and plants grown right on the farm. The tomatoes, onions, lemons, and more hanging in bunches from the wood-beamed ceilings were so delightfully unexpected; my family and I had never seen anything like it. It was a visual feast that made the meal even more spectacular. 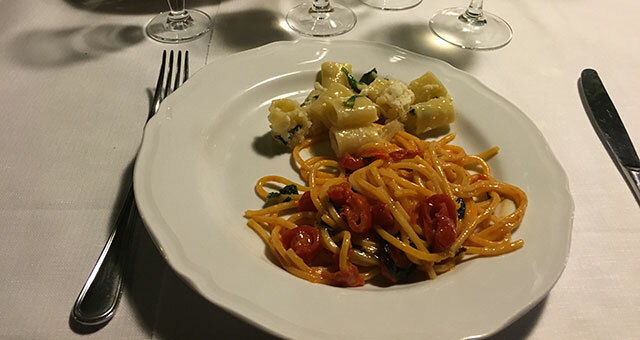 It doesn’t get any fresher than the courses set before us during this excursion, and the expert preparation highlighted the cooking styles of the Italian coast and allowed seasonal flavors to shine. For almost three hours, overflowing plates of home-cooked specialties made their way from the kitchen to our table, and each was even more delicious than the last. Roasted eggplant, tomatoes, and basil; charcuterie boards covered in cheeses and cured meats; a pot of cannellini beans full of mussels and clams; two different types of al dente pasta tossed with fresh veggies, sauce, and cheese—we feasted on the best-of-the-best and went away stuffed and satisfied. Vino is practically synonymous with Italy, and the regional red and white served by our experienced sommelier, Luigi, were perfectly paired with each course. While we were able to learn a bit about the vintages we were sipping, Luigi didn’t interrupt often to explain them; he just let the pairings speak for themselves. Another favorite beverage? The house-made limoncello. It was strong and sweet—the best I’d tried on the whole trip—and I loved it so much I bought two bottles. At only eight euro apiece, they were a steal! I made room in my suitcase for one to bring home as a gift, and my family and I split the other with two fellow travelers during the next leg of our trip in Rome. There were so many things that set this meal apart from a regular restaurant experience, and one of the most special was the fact that everything was cooked and served by the people who owned the farm. We really felt welcomed, as if we were longtime friends who’d sat down to dinner in their home. Empty wine glasses were promptly filled, clean plates whisked away and replaced. I even had a view into the kitchen, where I saw the owner’s young daughter decked out in an apron, helping her mom prepare some of our first courses. I swear, there was love in every bite. In our Italian household, a leisurely dinner with family could be considered the highest form of contentment, and this one was no exception. It was a special family meal where we spoke in wonder about being in such a beautiful place. Not only that, but the relaxed atmosphere, delicious cuisine, and plentiful wine made it the perfect opportunity for us to bond with our fellow travelers. We told stories from home and belly-laughed throughout the entire meal—there’s just something about sharing good food and wine that will do that to you. It was an amazing experience that bonded us with our group members for the rest of the trip. What’s the best meal you’ve had while traveling? Tell us about it in the comments below!